The present paper focuses on the development of a methodological framework for guiding decision making towards the sustainable tourist development of the island of Zakynthos-Greece. In this respect, potential future developments (scenarios) of the tourist sector are structured and evaluated in order to conclude with the most prevalent perspective. The scenario building process takes into consideration developments of both the: internal environment of Zakynthos island, where the mass tourism as a dominant tourist development model has resulted in environmental deterioration, increasing pressure on local resources, land use conflicts, etc. ; and external environment, delineated by the strategic objectives set for the development of the tourist sector at the national level, global trends in tourist demand and supply side, alternative tourist development paths, etc. Both the internal and the external environment define the decision environment, within which policy guidelines, serving sustainability objectives, are set. Scenarios and respective policy interventions take also into account that sustainable futures of the tourist sector in every single region have to be explored as a combination of both the: macro-level, where the development of an environmentally responsible, spatially balanced sector is sought; and the micro-level, where of crucial importance is an environmentally responsible low-carbon tourist infrastructure deployment. Finally some conclusions are drawn based on the experience gained from the application of the proposed methodological framework on the specific study region. Challenges of Twenty First Century have led to an urgent need to renew the spirit and satisfy spiritual needs, the effort which leads towards tourism as a cure to relieve the needs. It seems that tourism in general and cultural tourism in special can meet the needs of human. Since each region has its own cultural-religious characteristics, so this variety can attract people’s attention with other religious-cultural backgrounds. In Iran, holding ceremonies such as Tasoa and Ashura is an example of religious-cultural tradition of Muslims. This event, which has become a symbol of Shi’a religion and culture, has been performed during certain days and within public activity since long ago. The ceremony is the story of historical event in Islam and by having various ritual arrangements can internationally be considered as a tourist attraction. Therefore, visiting the event can remain in tourists’ minds as a memorable reminiscence. This paper attempts to introduce this ritual-religious ceremony as a different attraction with special style by reviewing literature and observation. The findings highlight the importance and details of Tasoa and Ashura in tourism and religious activities in Iran. The article ends with a discussion on the implications of the findings into practice. By having variety of ceremonies in these days, the event potentially can be considered as an important motivational factor for interested tourists. It seems that basically, Iran’s tourism industry should provide adequate information and with a proper marketing strategy enters to the market the same as other comparable countries. In this paper the author presents the ways in which the Greek National Tourism Organization has promoted Greece’s assets all over the world, from the creation of tourism posters to posts on Facebook, Twitter and Google+. Since the summer of 2010, the Organization’s marketing strategy has seen a shift in emphasis to online marketing as a means of staying up to date with advances in new technologies and repositioning Greece in the new digital landscape. In this study, a brief presentation of the material from traditional tourism campaigns paves the way for the online advertising of Greece and the efforts made on the part of the Organization to launch websites and to create new branded content; to participate in a virtual dialogue with the country’s followers and friends; to make successful use of the imagery of Greece—as social media platforms facilitate the sharing of photos; to capture momentary experiences of tourists in a microblogging post; to co-operate with major search engines such as Google and online travel agencies such as Expedia and to introduce novel promotional tools such as the monthly newsletter, the my-greece microsite, etc. This paper reports on an exploratory case study investigating the proposition that a locally-embedded organization may exhibit a natural tendency towards ethnocentric perspectives in website communication. 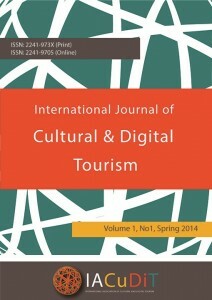 Particularly, in multicultural audience environments, such as exist in international tourism, ethnocentric website communication may impede the consistent formation of desired organizational image and undermine the effective transmission of product information among those stakeholders holding different cultural frames. The research builds upon the results of another study using Hofstede’s cultural dimensions in website analysis, by introducing the idea of ethnocentric tendency, and linking to the relevant theoretical arenas of organizational identity, organizational image and strategic communication. Empirical material was collected via observation, key informant interviews, workshop/focus group, website content analysis, customer surveys, and email questioning. Ethnocentric tendency was found to be a possible source of website miscommunication for the case organization. The results indicate scope for further investigation of ethnocentric tendency as a source of miscommunication in multicultural stakeholder environments. Women play a remarkable and outstanding role in nomad families therefore; they are important pillar of problematic and difficult life. As a result of literature left from distant past in nomadic areas, both nomadic life and nomadic women’s activities are as a part of cultural heritage. Women’s works serve family budget development. The roles of women in livestock, production of various livestock products, active participation in agricultural work, making fine craft as a tourist attraction, as well as their role as a wife and mother have made them as strong support for their families. All efforts of nomadic women are to use limited and few facilities to create well-being for family and economic independence. Consequently, women are well done their duties through content, adequacy and tact and they try to handle issues alongside of their husbands. This paper studies the various actions of Kurd nomadic women from Northern Khorasan due to their content, adequacy and tact in family and economy by using observation. Results show that women try to increase productive economy in nomad and decrease consumption and expenses of family by involving in different fields. Thus, they apply content and adequacy simultaneously. Historical, cultural and environmental attractions absorb investments in tourism industry in certain regions. The tourism industry has always been based on visual attractions. This article, however, tries to study the feasibility of audio attractions in absorption of investment in tourism industry. The question is whether sounds can attract tourists to a particular region? Music and different musical instruments in various regions may well have this potential. Besides, would it be possible to attract tourists to a region through environmental and peripheral sound effects? Is it possible to relate a specific sound to a definite region to be known as its attribute? Creating audio tourism can only be done through the historical, social and cultural backgrounds of a city. The case study on three cities of Tehran, Mashhad and Isfahan demonstrates that audio tourism can not only help tourism industry grow but is also rich enough to be considered as a separate subject matter. Audio parameters can be used in tourism industry for advertising in different multimedia including in travel agencies and museums as well as in souvenir and gift shops. This article elaborates how these sounds can be applied to individual cities and in what ways audio tourism may develop.